TRIPS, Bilateralism And Patents: How They Are Failing Both the Developed And The Developing World and What To Do About It. The vast majority of the world’s biological resources and traditional knowledge is located in the developing world, yet the vast majority of the world’s intellectual property over biotechnology is owned by the developed world. Since the formation of the WTO the developing world has supported the developed world’s demands for stronger intellectual property protection. However, as it now seeks the support of the developed world to exploit these resources, it finds that the developed world has only responded with overtures of bilateralism. Furthermore, the expected increases in foreign direct investment have not materialised, yet have continued to flow to China, a country that is the world’s largest producer of counterfeit goods. 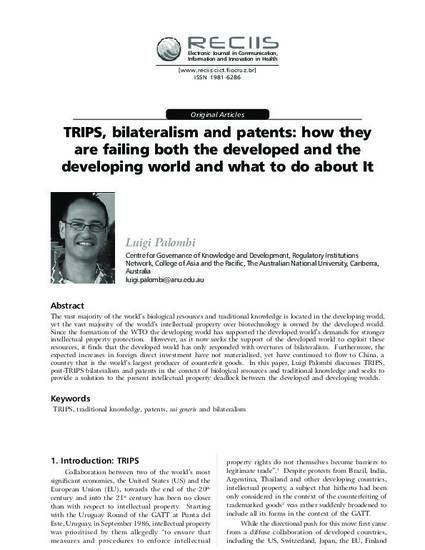 In this paper, Luigi Palombi discusses TRIPS, post-TRIPS bilateralism and patents in the context of biological resources and traditional knowledge and seeks to provide a solution to the present intellectual property deadlock between the developed and developing worlds.